Today is the first morning here we haven’t put the heating on. It’s cold! But it’s okay. We’ve done loads as ever, rushing around like mad and getting to loads of new places. We also seem to have eaten a vast quantity of chips. One big progression, we decided not to take the flexibath (which still gets a lot of use at home despite H being so tall) and she’s started taking showers! This may have involved a Moshi Monsters tattoo bribe or two…. We also managed to completely miss the army firing range right next to the site! Which I find kind of funny, how can you miss something like that?! It’s like someone letting off fireworks. It is lovely and quiet and we’re getting sleep which is what we all need. I’m also happy I bought some internet as it works in our caravan which it didn’t last tme (though was free and unlimited) – good job as my Everything Everywhere (to be rechristened not very much in most places) reception is rubbish. Friday – Lyn and Melissa arrived from Gatwick in time to catch H at bathtime. Saturday – we had our first 3rd birthday party of August at Sutton Arena, so headed there – it was a hot day too, and a fun party although H cried a couple of times. Got back and popped to the neighbours as they’re adopting a boy and girl and wanted a social with everyone which was nice. 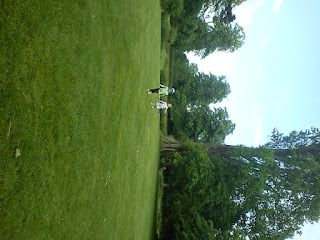 Sunday – Kew Gardens, lots of walking and lovely weather too. It feels like a billion years ago. 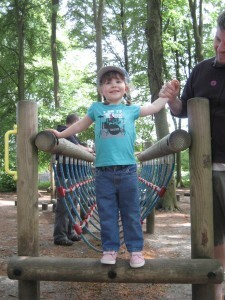 Thursday – Peppa Pig World/Paulton’s Park It was excellent, H went on her first rollercoaster. I nearly cried. It was ace. Friday – recovered, made some birthday cakes and prepared for the party trying to make playlists and party tunes for 3 year olds. Saturday – We had to drive to Crawley to pick up a hire car for Monday, as Shaun realised most hire places close at midday and nobody had what we needed. 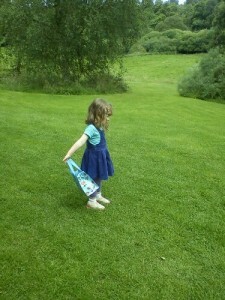 Thank god Gatwick isn’t too far away… H’s friend C’s 3rd birthday party in their back garden. They hired a bouncy castle and gave us some baguettes that didn’t get used as we needed some the following day for…..
Sunday – H’s 3rd birthday party. Mum came down from York for the day on the train, my sister was already down as of the previous day, so H met both her nanna’s at the same time for the first time in her life. The party went well, only a few minor incidents and everyone seemed happy, so that makes me happy. We now have a gazillion ThankYou cards to write. I’m not entirely sure when they’ll be done. Tuesday – Shaun’s birthday – went to Conwy and Caernarvon castles, as well as Llanfairpwyllgwyngllgogerychwyryndrobwlllantysiliogogogoch (which I’ve spelt off the top of my head so I apologise if wrong) which is very touristy these days and not like it was in the late seventies (bought Shaun a mug, this is so far the sum total of my birthday presents for him and I am ASHAMED). We stopped for our evening meal in Beddgelert where I thought Gelert had a little cottage, but I’m actually getting it mixed up with The Ugly House in Betws-y-coed which we didn’t see. Wednesday – Portmeirion. It felt more like it did in the seventies again – I spotted painted in windows and things which kept it mysterious. My chances of doing a ‘Dear Photograph’ gone as the half boat my sister is pictured in back then is long gone, thanks to probably rotting – plus I didn’t get a print of the photo anyway. 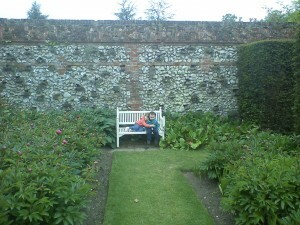 H managed to get her head stuck in the railings of the stone boat. Friday – came home. Took all day. Lost the will to live. Stopped in Powis Castle on the way home which was quite lovely. 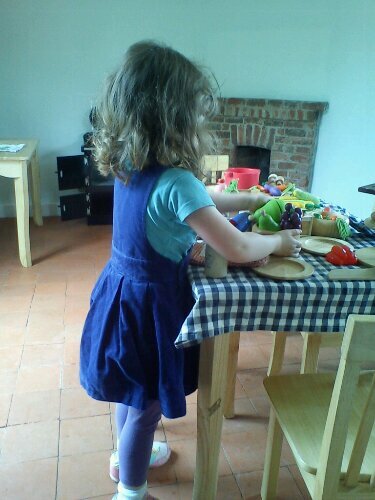 Saturday – Shaun took back the car, I stopped everything and relaxed all day with H playing games and opening the rest of her presents. Sunday – went to our local model railway run by enthusiasts, it was pretty ace. 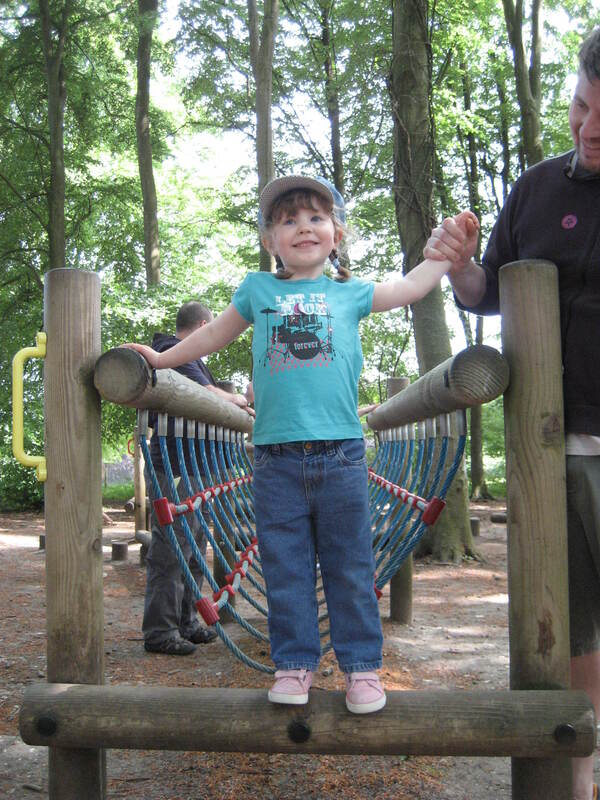 Monday – Bank Holiday, we went to the Natural History Museum to see the dinosaurs, followed by the Diana Memorial Park which was rather fab too. Tuesday – the in-laws left and I went back to work. 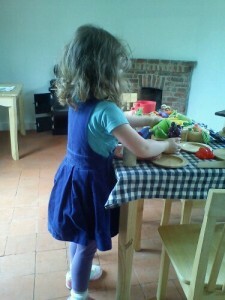 Wednesday – H’s haircut in Bigoodi in the morning, Dora Live in London in the afternoon. Food at Wagamama in the evening, and bed after midnight due to forgetting it was the Paralympics opening and I knew three people performing (and spotted none of them). 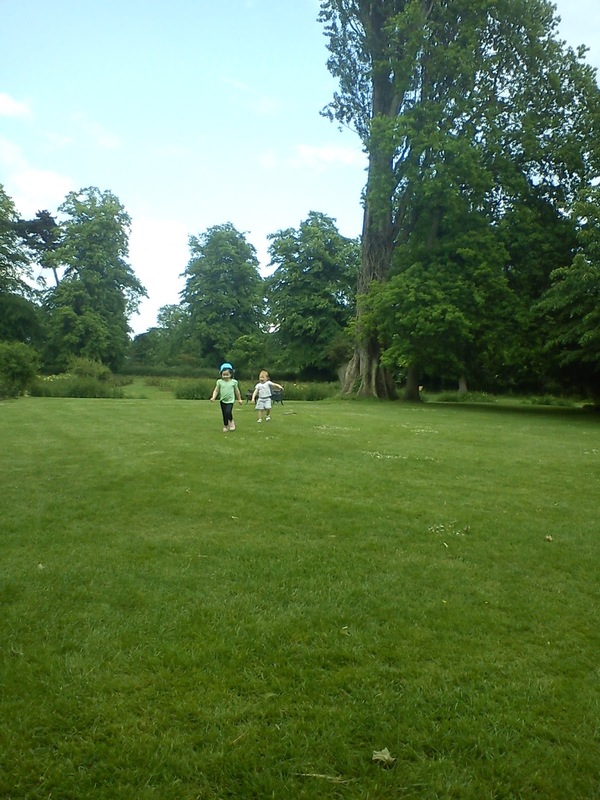 We have loads of National Trust places near here which is great as we definitely get our money’s worth as members – yet the one we keep going back to is Polesden Lacey near Dorking; a large house (which I think we’ve been in once) and grounds, loads of grounds to wander around and explore. We were set for a sunny afternoon so I persuaded Shaun to leave his study for a few hours to make the most of this tiny window of nice (plus it’s the Bank Holiday), and fortunately he agreed. 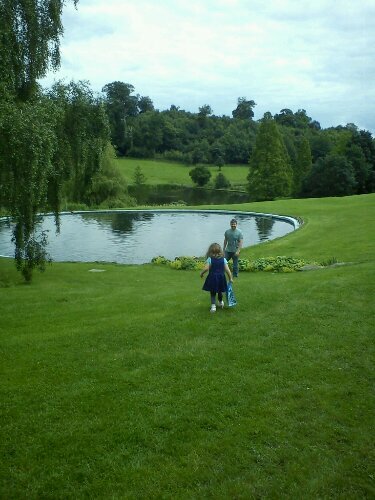 Interesting fact about Polesden Lacey : the Queen mum and King George VI stayed there for part of their honeymoon. So it’s quite posh. My favourite part is the tree tunnel which takes you close to the children’s play area, however, today we explored some areas we’ve missed in the past. I had no idea there was a dog graveyard there – trying to explain that to toddlers was interesting… they had fun in the walled garden though. Then there’s chickens! I had no idea about these either, they were perched in the trees which excited the toddlers. Just down from there was a croquet lawn (cue the toddlers pulling up the poles or climbing over them…) until we found the rock garden and sat down for snacks. Post snack-time and we made it to the tree tunnel, then to the play area and on to the golf course (which is the clock and one hole you have to pot into), and finally the obligatory ice cream stop. 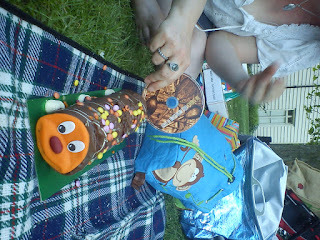 Of course, you give the toddlers something sugary, they go a bit crazy. 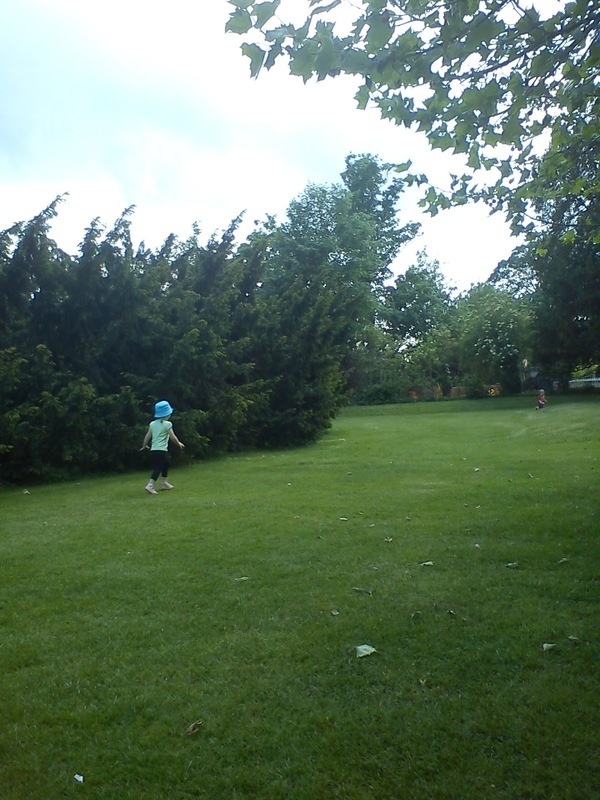 So for the next twenty minutes we had H running in one direction, only stopping as there was a National Trust tent (I think she’d have run forever otherwise), and J running in the other direction back to the golf area (he’s quick too and it was a good distance). Cue both sets of parents carrying the toddlers and distracting as much as possible until they’d forgotten what was going on. On getting back in the car to come home, H was asleep within two minutes. On being put to bed at her usual time she’s settled and is probably well on her way to deep sleep now. Result! I loved today. It was one of those days where it felt great. A lazy morning until we went swimming, a lesson that went really well (we’re starting to push them through the water more so they start to swim on their own), a play in the park afterwards and a chance to meet four day old M, a sunny drive home and a trip to our local National Trust park, Morden Hall Park for an outdoor picnic and birthday celebration for J who is two today. Add to that J’s mum and dad are moving and that all fell into place today, and yes, it’s been a good day for others too. A very very good day! The toddlers ran around the open grass finding things to play with, which seemed to revolve around a cut down tree stump they could stand on. 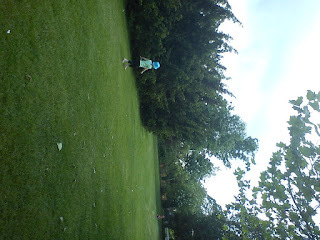 That or they all stood waving their arms around doing some kind of crazy toddler dance. It’s been a really good day. Tomorrow is going to be a really good night too, though a sad one as it’s J’s mum’s leaving do and we’re all going to miss her. 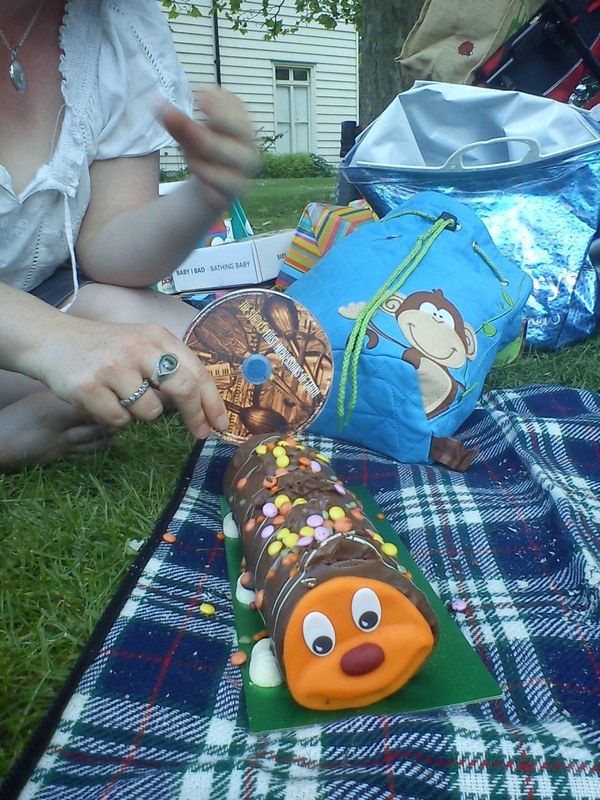 J had an excellent birthday cake, but R forgot to bring a knife – so improvised and used a Strokes CD (and in the background you can see the coolest of bags which is owned by J the birthday boy). 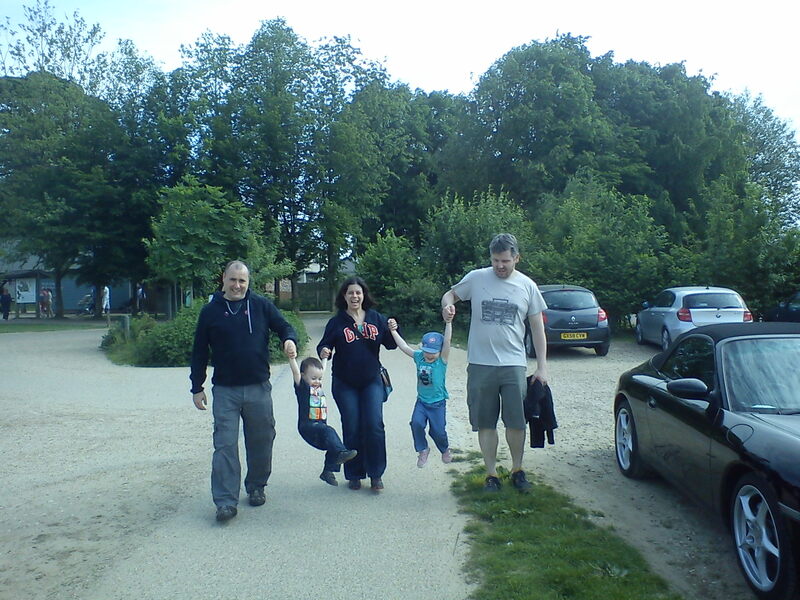 We went out after H’s nap today to check on the bluebells at Hatchlands Park, mid-way between Leatherhead and Guildford – and to get some fresh air and a bit of a walk in the process. First off, there were some muddy puddles that needed testing with new wellies. Daddy’s, that is. So we didn’t get lost, our lead navigator checked the route to the woods. Plus there were some birdseed birdhouse thingummies, with birds. But oh, better was still to come. 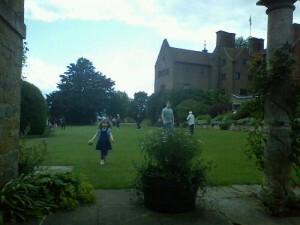 we got to the National Trust shop and went for a nosey at the books. There on the shelves were four I Spy books! I had no idea they’d relaunched!!! But they have!!! It made me too excited, so of course we had to buy H her first I Spy book, one for the garden. She’s pretty excited about it too. I LOVED my I Spy books when I was younger, so now I can continue to re-live my childhood through H. I’m pretty happy with that. We’re just getting to the end of our second year of National Trust membership, and it’s something I’m so glad we did. It’s not great this time of year, however, as Shaun has a lot of study so we don’t get out as often as we should. Living where we do, we have a lot of places within 30-40 minutes drive – the closest being Morden Hall Park (which you seem to be able to use for free anyway), and slightly further out, places like Polesden Lacey and Claremont Park. This weekend just gone we made it to Claremont Park – on an overcast Easter Sunday. I thought it’d be packed, but actually it was fairly quiet – quite a lot of families doing the Cadbury’s Easter Egg hunt (we did too), wandering around the grounds. 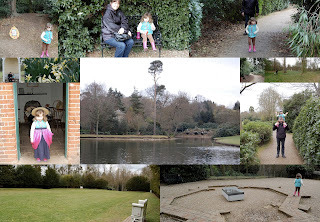 I really like Claremont Park, as it’s similar to Painshill Park, but on National Trust terms – in other words we’ve paid to get in with our membership, whereas Painshill is quite expensive, so a treat. They’re both landscape gardens, and involve hills and good views, and enough to keep you occupied for a couple of hours (at least!) – and a big first for us – our first trip out without the buggy, all of us going on foot. H coped fine, although sat on Shaun’s shoulders a few times when she got tired, Claremont has lots of random white benches around it which are good for the occasional rest (and as it wasn’t busy this wasn’t a problem) and the hills aren’t too tiring (I do find that with Painshill) – plus the thatched cottage had some clothes to dress up in a large chest which kept H amused for a while. Hatchlands Park near Guildford will have bluebells springing up in their woods around now, so I suspect we’ll be heading there this coming weekend, before they’re gone for another year. We’re so lucky having so many excellent places so close.